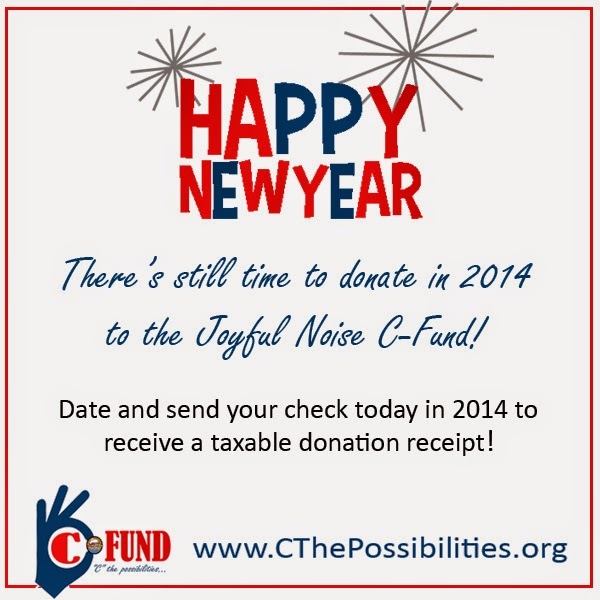 There's Still Time to Donate to the C-Fund in 2014! Thank you so much to all of our generous donors this year! We are especially grateful to the wonderful memorial fund donations we received honoring the lives of John Sturgill and Carol Kasmauski. We have been blessed! It's not too late to send a donation for the 2014 tax year! When you donate to the Joyful Noise C-Fund, you are supporting the needs of not only young children in our care, but also those in the community that benefit from our free services such as early childhood music classes and community events. Together, we can "C" the possibilities! Don't forget you can donate via credit card or paypal right here at the website, to your left!